Syllabus of the Online Course (Subject): Indonesia-Malaysia-Thailand Growth Triangle (IMT-GT). Introduction to the Indonesia-Malaysia-Thailand Growth Triangle (IMT-GT) - Southeast Asia ASEAN. 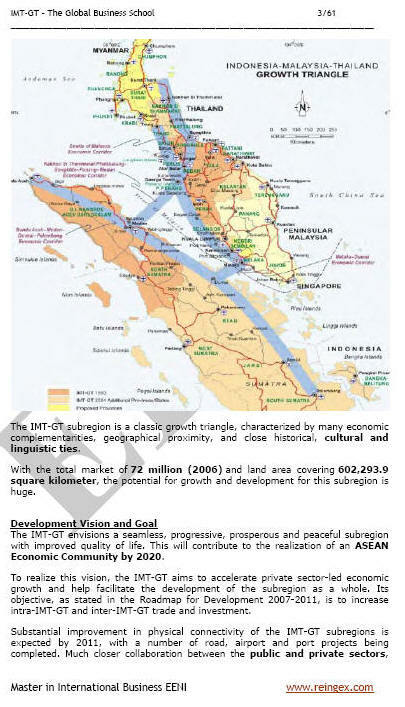 The Indonesia-Malaysia-Thailand Growth Triangle (IMT-GT) is a subregional cooperation initiative created in 1993 by the governments of Indonesia, Malaysia, and Thailand with the objective to speeding up the economic transformation in the less developed provinces of the IMT-Growth Triangle region. In Indonesia and Malaysia, the main religion is Islam. The Asian Development Bank is a development partner of the IMT-GT since 2006. The Association of Southeast Asian Nations (ASEAN) Secretariat is a valuable ally of the Growth Triangle that provides assistance and linkage to development-. The Roadmap of the Indonesia-Malaysia-Thailand Growth Triangle (IMT-GT) identifies four economic connectivity corridors as key to increase international trade, foreign direct investment, and tourism through strengthening regional connectivity.